We’ve seen many ancient sites in Ireland; monastic beehive huts from the fourth and fifth century, ruins of monasteries from the 14th and 15th centuries and the even older burial site of Newgrange, dating back to about 2,000 to 3,000 years before Christ. But the other day’s discovery on the windswept shores of Valentia Island, on the Iveragh Peninsula (tour bus prisoners know this as the “Ring of Kerry”) we found something which is much, much older. About 344, 999, 000 years older. While driving in search of the marker at the place where the first trans-Atlantic cable was laid, we literally stumbled upon a sign showing the way to footprints left behind by a “tetrapod.” What is a tetrapod? This is our ancient ancestor, according to many scientists, biologists and other people belonging to the “ist” family. This three or four foot long beast similar to an alligator slithered out of the oceans all of those millions of years ago, took a breath, and decided to stay on dry land. This was the first large creature to adapt to life on dry land. And, the tetrapod is the ancient ancestor to those creatures who first moved to living on land. 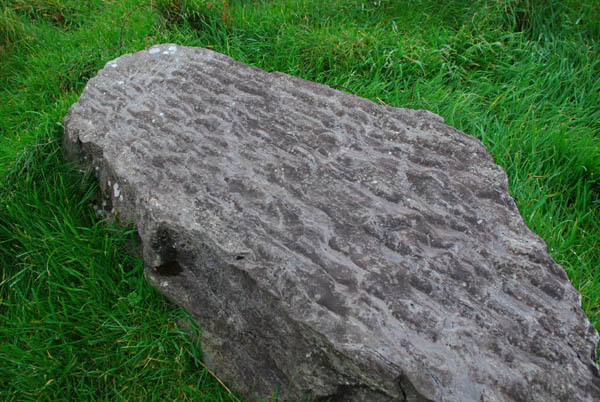 A third of a billion years ago, Ireland was located south of the equator. The muddy shore where this tetrapod crawled solidified into rock, and this rock preserves not only the footprints of the tetrapod, but also faint impressions left by the dragging of the long tail, which accounted for almost half of the tetrapod’s length. 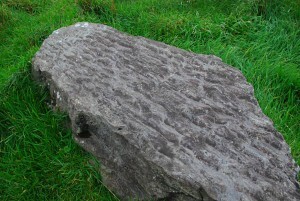 Over millenia, Ireland drifted north and the muddy shore ended up on the north side of Valentia Island. 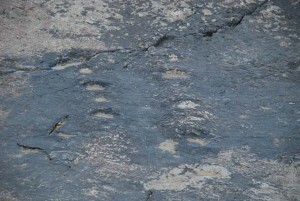 To look upon those footprints is to be awed by the steady march of time and the fact that we modern humans have only existed for a second or two in the history of the earth. 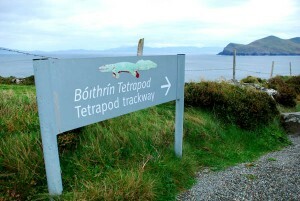 Posted in Ireland Tours and tagged island, tetrapod, valentia.